Shanghai's development across about 6 millennia will be on display as the new Shanghai History Museum opens to the public. The Shanghai History Museum, which opens to the public today, is seen on Nanjing Road W. The museum offers a sweeping perspective of the city from 4000 BC to the founding of the People’s Republic of China in 1949. More than 1,000 exhibition pieces are on display. SHANGHAI History Museum opens to the public today, with a sweeping perspective of the city from 4000 BC to the founding of the People’s Republic of China in 1949. More than 1,000 exhibition pieces trace the history of political, social, cultural and commercial evolution in Shanghai. About four-fifths of the items have never been on public display before. The museum is housed in the former Shanghai Race Club next to People’s Park on Nanjing Road West. Admission to the permanent exhibition is free, but numbers of visitors will be capped at 10,000 a day, with no more than 3,000 allowed inside at any one time. The museum will be open from 9am to 5pm, Tuesdays through Sundays and on all national holidays. The opening on March 26 is an exception to the rule. The museum as an institution was established in 1953, but until now has never had a permanent home. Its permanent exhibition is located on four stories of the five-story East Building of the complex, divided into ancient and modern collections. The West Building, a former stable, which is still under refurbishment, will contain exhibition halls, museum shops and leisure functions. On the first floor of the museum, visitors can receive a general, brief introduction to the history of the city. One of the highlights there is a 2.8-meter-high sedan chair from the period of the Republic of China. The wedding chair took 10 years to construct by Zhejiang Province craftsmen. It was commissioned by a local private business owner for his son’s nuptials. 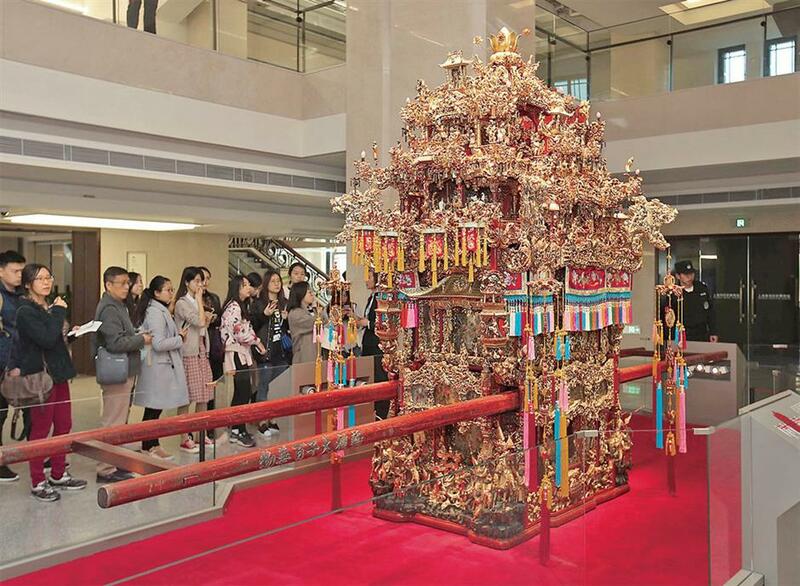 Visitors admire a 2.8-meter-tall sedan chair, a highlight of the exhibition, at Shanghai History Museum. The museum contains exhibits to fascinate a wide array of visitors. From ancient times, there is the skull of the first Shanghainese, excavated from the Songze archeological site in suburban Qingpu District, and a rare porcelain bowl in blue and white glaze from the Tang Dynasty (618-907) — so rare that it’s estimated to be one of only about 10 in the world. On display are rarely seen admission tickets for candidates of the imperial examinations, and a painting from the Qing Dynasty (1644-1911) of a top Shanghai official holding a banquet for a German aristocrat at Yuyuan Garden. Exhibits from more modern times depict the early economic boom of the city, including its volatile periods. 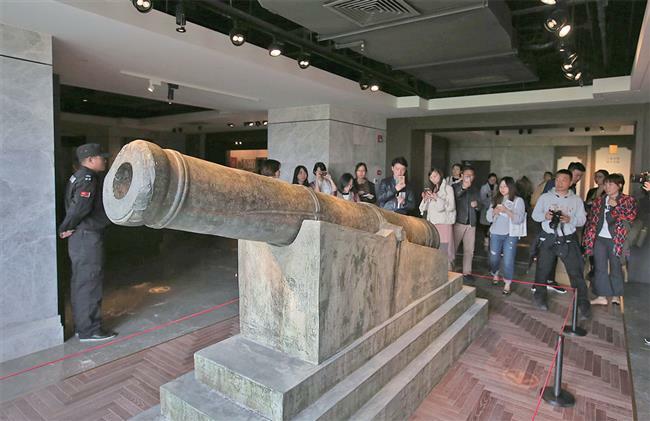 A large bronze cannon made in 1841 and unearthed at the Western Wusong Fort in 1984 bears testament to the Opium War in Shanghai. Visitors can also view a boundary monument from the former American Concession in Shanghai. A large bronze cannon manufactured in 1841 and unearthed at the Western Wusong Fort in 1984. The cannon bears testament to the Opium War in Shanghai. Hallmarks of life in the late 19th and early 20th centuries include a kerosene lamp, known back then as a “Mobil lamp” after the US Mobil Oil Co, and two bottles of Aquarius soda pop from the first soft drinks factory in China. 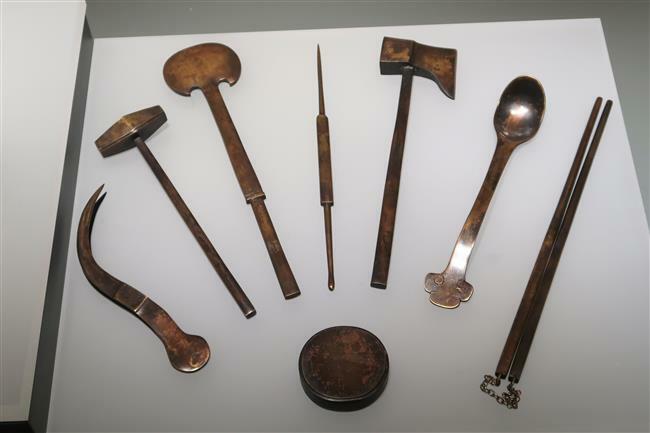 Visitors may also be intrigued to see eight old tools for eating crabs and various utensils for taking opium. 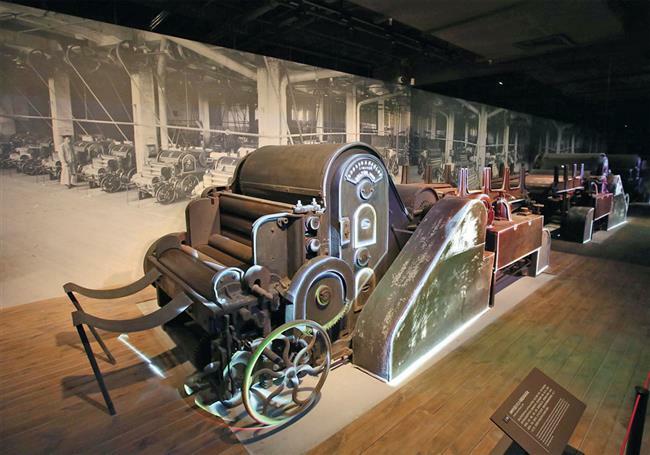 The largest exhibits include a composing machine used to print the North China Daily News, an influential English-language newspaper in China that began publication in the mid-1880s, and a cotton-cleaning machine made in 1895. The exhibitions also capture the city during revolutionary periods and years of struggle during the Second World War, under the leadership of the Communist Party of China. The eight tools for eating crabs. A cotton-cleaning machine made in 1895. The new home for the museum is a monument to the city’s history in itself. The Shanghai Race Club was founded in the mid-1880s. The building that stands today was constructed in 1934. Since its namesake activity ceased, the site has housed a series of public facilities. Renovation of the building began two years ago under a project to restore it to its original look as much as possible. Doors, windows and ceilings from the earlier era retain their original appearance. In a second-floor exhibition room that was originally a club members’ salon, a fireplace has been preserved. In a bid to protect the historical architecture, the museum uses lighter materials than glass to frame exhibits, where possible. Qiu Zhengping, vice curator of the museum, said experts have warned of lower weight capacities on the second and third floors of the East Building. 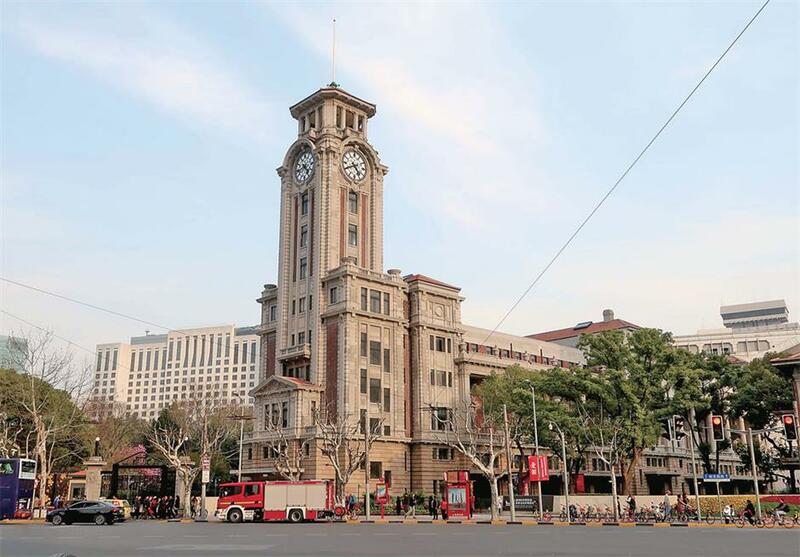 The bell tower peals forth again, striking hours to the tune of “The East is Red,” which is also played by the clock tower on the Bund. Exhibit information placards are written in both Chinese and English, but most interactive features are in Chinese only. Hu Jiang, curator of the museum, told Shanghai Daily that English audio guides will be available in the future. In addition to the permanent exhibition, there will be four special historical displays through June 24, including selected oil paintings of the city and the history of the Communist Manifesto.